Mission statements are everywhere: you have to have one, whether you’re a Fortune 500 company, a hedge fund, a primary school, a church or a hockey club. Without a mission statement, who would know what your values are, or what your culture is? And how then, going forward, will you get buy-in on your strategy and uptake of your brand? The language of modern management has triumphed, transforming clear, everyday communication into meaningless sludge. To sound professional, you must express everything in abstract nouns, and each noun in terms of another one; you must talk about synergy and strategy, uptake and outcomes and outputs and inputs, key performance indicators and drivers and customer experience - even if your ‘customers’ are in fact patients in your hospital. This language is deliberately obscure and falsely scientific; what is more worrying, those who use it have lost the very ability to think clearly. 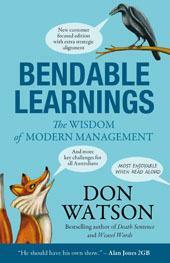 From Don Watson, the author of Death Sentence and Weasel Words, comes this new assortment of noxious management drivel and financial market blather. Read them aloud - then try the exercises. The disease may not yet have run its course, but Watson’s acerbic wit restores hope in the power of well-chosen words to entertain and to inspire.